This might be outside the realm of support for my issue, but I'm hoping someone can assist so I don't have to tow this to the dealer. Basically, I'm in the middle of installing my Maestro RR with a new radio. I've powered on the car multiple times after opening up the dash for various reasons (getting out a CD from the old radio that I forgot to remove, making sure the car was still drivable without any radio or Maestro, etc). I'm still waiting on a few parts to arrive in the mail like a new bezel, so I was waiting on the install of the actual radio as well. This evening, I decided that I wanted to trace down the SWI 2 wire since I have Sync with the Base MKZ and prepare to tap into it. I located what I believe was the correct cable (blue/orange) in the harness going to the Sync module. I unplugged the connector (C3052 if you have a wiring diagram), plugged in a T pin in the female side to pin 8, and plugged in my old radio per the directions. The key was not in the ignition, but after I plugged it in, the radio started cycling the CDs (normal behavior based on the last few times I did it), and everything looked good. Unfortunately, the moment I turned the car to accessory, everything went to hell. The car started making a bunch of clicking noises, the lights started rapidly flickering, power was lost to the radio, etc. I turned the key back to off, but the issues continued. Thinking that maybe the harness leading to Sync was causing issues unplugged, I disconnected the negative battery terminal to kill it all, plugged all the harnesses back in (obviously removed the T pin), and reconnected the negative lead. Immediately (and without a key in the ignition), the car went back to lots of clicking, rapidly blinking lights, a buzzing, and basically a total cluster. I noticed the lights were pretty dim (they weren't just a minute before all the craziness started), so I checked the voltage at the battery with the neg disconnected, and it was a hair under 11. I know that's bad, but I don't see how that would lead to crazy electrical issues, just a dead car. Don't really want to jump it out of fear of damaging the donor car with all this going on. Basically, does anyone have any ideas? My gut says something is shorting out, but I don't understand how that could happen from simply removing the connector, unwrapping it, and T pinning the female connector. Fuses maybe? I'm not an electrical expert by any means, but of course I"m a little worried I fried something important/expensive. Sounds to me like a dead battery. you can take take out of the vehicle and put it on a charger or take it to a pep boys or similar store that has the ability to perform a battery test. If they deem it good they will recharge it for you and some places do this for free. If it is bad then you will just need to get a new battery. Best of luck! Thanks, Justin. Battery is at AutoZone now for a charge and load test. It tested at 11.5v both this morning and at AZ. No idea how it increased the voltage by sitting overnight, but it's obviously still very low. Is it actually possible for the accessories and lights and such to turn on by a battery that does not have enough juice? Maybe something in the ignition is interpreting a specific (lower) voltage as a signal to power up the accessories or something and it just bounces back and forth? I suppose I'm trying to figure out if whatever I did could have rapidly drained the battery and the low battery is actually a symptom rather than a cause. Like I said, hoping from an answer from AZ soon, but I'm just thinking out loud for the possibilities in the meantime. Well, good news! The battery is charged, and everything is back to normal. Just need to jack into the SWI 2 point now (and hopefully not brick the car again). Can you confirm that I can cut the blue/orange wire leading into this harness and wire it to the pink/red wire on the Maestro? I'll try to test it with my multi meter, but I'm just hoping for clarification that this cut point is okay. 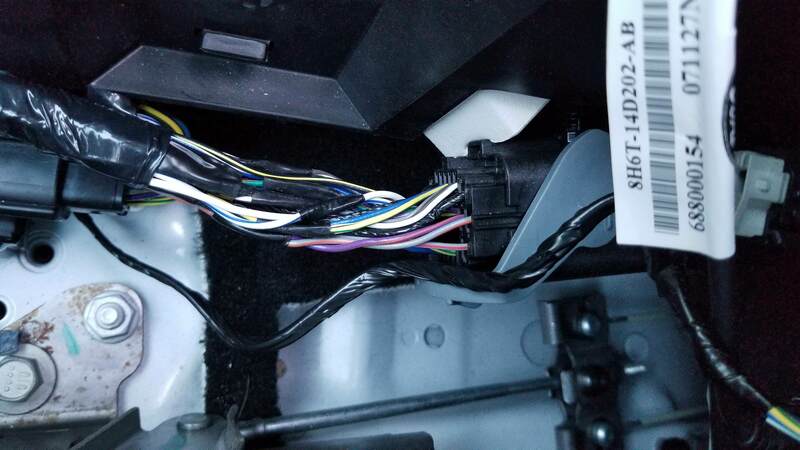 I believe the Sync module is technically even further back in the console and past one or two other connectors, but I think the directions are telling me it's okay to jack into the harness at this point instead of going all the way back, and the wiring diagram seems to agree, but just looking for confirmation from the experts.